©2005 John Hodgman (P)2006 Penguin Audio, a member of Penguin Group (USA) Inc.
John Hodgman's first of three books of fake facts or "complete world knowledge" is so incredible, but it's more than just a book being read by the author, Hodgman takes his already hilarious work and turns it into an absolute performance with guests, musical accompaniment and more than what was ever on the page. It's dry, it's weird, but it's so amazing! I've listened to this book 3 or 4 times already and I've bought it again here on Audible just to have it on hand wherever I am and so I can play it for whoever will listen. Couldn't even finish the first chapter. This is so lame! Hope it's not too late to get a refund! I must admit that I was a little dubious about this one. If you've seen the actual book, you know it is full of tables and lists and lots of other things that would seem to make for a truly horrid audiobook. What a great surprise! The audio version of "Areas...." is *completely* reworked, absolutely hilarious, and an excellent example to anyone who would like to work in this medium. Hodgman adds examples, music, and stories to replace the most of the hopelessly complex tables. This obviously took more effort than the typical "sit down and read it" audiobook, and it was well worth it. This is very very funny. Don't play it for anyone under 13; there is some risque language, and they won't get it anyway. Clearly this is not for all tastes, but I adore this recording; I revisit it regularly, something I hardly ever do with audio books. It is frequently hilarious, but more than that, it is simply engaging: when I listen to it, I feel like I am hanging out with some eccentric old friend. I purchased the print copy of this book a few months ago and never got around to reading it until one day I opened it up randomly and dove in. It made me spill my milk. The book is comic brillance. Audio version is a treat as well with the author's sardonic delivery. I would much rather spend an evening with John Hodgman, or this audio book, than any of the people who couldn't find the humor in it. After going through this book, I can't help but wonder what it must be like to even spend one single minute as John Hodgman. It truly must be an extraordinary experience to which nothing compares. It must have taken him a lifetime to amass THIS much fake knowledge/trivia... Which doesn't seem to make sense, but he is, in fact, living proof. If you're hoping that this book will get you some interesting tidbits of information you can whip out at a party to impress friends and associates, don't bother. On the other hand, if you're interested in the secret code-language of hobos, then this is the book for you! The word "droll" was invented for this pleasantly silly, highly-listenable collection of nonsense. 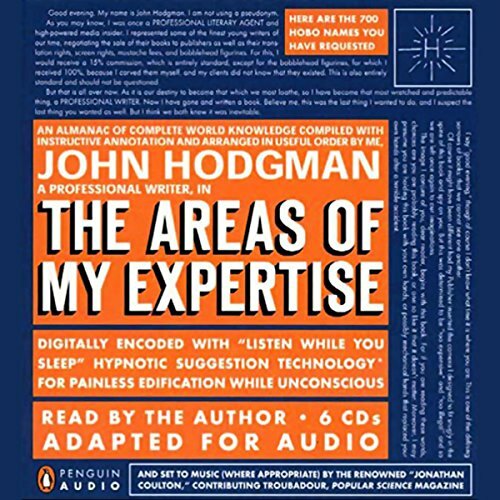 The production is actually an improvement over the print version as Hodgman wisely avoids literal readings of much of the material (which included endless charts and lists), instead treating it as an extended radio broadcast, incorporating music, sound effects, and continuous banter with longtime friend and collaberator Jonathan Coulton. Listened to in small segements, this low-key offering provides the perfect antidote to a high-stress filled day. The only thing you can expect from John Hodgman is to expect anything. He throws in just enough of the truth to make you realize that this is not an utter work of fiction, but this almanac of made up facts is one thing above all else: a great read and very funny. I already enjoyed the print version of this book, which combines the sort of brainy surrealist humor appreciated by Monty Python fans with Hodgeman's charactaristic dry wit; but the audiobook is an entirely different experience, with the bonus of his troubadour, Jonathan Coulton and the bizarre pleasure of his reading 700 hobo names aloud. Be warned, Coulton's "Furry Lobster Song" will get stuck in your head. If you like nonstop absurdity read where the sheer volume of humor ultimately read with author as its straight man reading with all due seriousness (like the "Airplane" or the "Naked Gun" movie series) - it's not the first joke that gets you but the 25 that come right in a row that finally gets you smiling or laughing, then you might like this book. Yes, it is whimsimal and very silly. Still, I felt like this was all being written right off the top of the author's head. Serious silliness requires some serious planning. Yes, it took time to think of 700 really silly hobo names but listening to them all became dull. There were only one or two laugh-out-loud moments for me. The rest is mildly amusing. I tend to over-rate books so three stars from me is LOW. Monty Python humor is seriously intellectual. Not this book, it is absurdist - to be sure- but not laugh out loud craziness. Airplane movies at least have a plot and physical comedy. If your expectations are low you will enjoy it, if you are expecting comic genius (as I was) you will be somewhat disappointed. One note: The audio version does some jokes involving the musical parts/background also done with the same deadpan mock seriousness where the jokes involve getting the right musical sound. It is nice to feel you are getting a bonus for buying an audio-edition and that the author exploited that angle. Still, it wasn't enough to make it a "must listen". I have the paperback version of this book but wanted to listen to the audio version as I read. I was more than impressed to find that John Hodgman went WAY above and beyond in the recording of his audiobook. A lot of authors don't even read their own audiobooks. Not only did he do that, but he also had Jonathan Coulton play music in certain parts and had Paul Rudd read a short excerpt of the book. Even more surprising, Hodgman went over nearly all of the tables in the book and read each and every one of the 700 hobo names. I have never found myself wondering if an audiobook was better than the written book, except in this case. I would recommend this audiobook to anyone, whether you have read John Hodgman's books or not. Hodgman's dry wit, keen intellect, weird sensibility, and hilarious timing are all on display in this stellar adaptation of his almanac for the new millennium. This is not simply a reading of his book (although it is mostly that), but a brilliant audio adaptation that takes full advantage of its departure from the printed page. Jonathan Coulton is a delightful addition to the festivities. You will laugh till tears stream down your cheeks.